I haven’t always been obsessed with Disney. In fact I didn’t go to Walt Disney World until I was 21 years old. I realise this would be unheard of for some people, even with the excuse of living in the UK. I won’t be making the same mistake with my daughter, Felicity (F), whom we are hoping to take to WDW by the time she is 4. I tend to call her Tink but that would just cause confusion with the original Tink on this page!!! She is now almost 7 months and something of a handful. However she is already a big fan of all things Disney I am pleased to say. Although we won’t be taking her to WDW for a few years yet, we have just returned from our first family vacation to France. 1. Work out exactly which clothes you wish to take for your child and bear in mind whether you have laundry facilities or not and then … half it!!! I was warned that I would take too much especially as we were staying with family and therefore could wash anything that was dirty but I still packed a whole case just for Felicity! And of course as it was her first trip, we ended up buying stuff for her too so there really was not the need for a lot of what I took. However, I would always recommend an item of warmer/cooler clothing. Although it was forecast for 30 degrees in France I still took a sweater and waterproof for Felicity and was glad I did as the evenings could be a little cool and it certainly rained a couple of days. Always make sure you have plenty of sunscreen, hats and a parasol too. F was roasting in the midday sun on the days we ventured out and she was always smothered in sunscreen. I'd recommend bringing it with you as you don’t always know if you can get the same make abroad. If your child’s skin is used to a certain make, then I wouldn’t want to try out a new one on holiday! This is all applicable to a trip to Disney, that’s for sure! The boiling midday sun, the rain and the cool evenings are typical of Florida, not just Europe! And for UK travelers I would still advise taking skin care products just in case. 2. Make sure you have plenty of entertainment if you have a long drive/plane ride. I had already read a blog post by Amy suggesting iPhone/iPod applications so I decided to download some for the almost 12 hour drive across to France. Typing babies into the app store search engine threw up a load of lite options which mean that they are free. Since I didn’t know whether F would be interested I decided to get these options. I installed Play Phone, Baby Piano, Toddler Counting and Baby Flashcards. I should have also considered the fact I wouldn’t have access to cable or wifi for 2 weeks and bought an episode of Mickey Mouse Clubhouse from iTunes. For our next trip this will be a must have item as well as a Playhouse Disney DVD! We are also hoping to have an iPad for the journey next year which will keep F entertained as she’ll be 18 months by then. Anyway back to the apps. F loves the phone and the piano. They’re fairly easy to use and would suit from a young baby just becoming interested in things up to toddlers who like to grab things for themselves. The phone app tended to freeze when F tried to push too many buttons at once but the piano was great fun. The baby counting was ok but the flash cards were great and the noises kept F entertained for ages! Just for fun I also downloaded the Disney Fairies Tinker bell game, which F is far too young to play with, but she enjoys watching me play and seeing Tink flying about. Again I just got the lite free version. 3. Always make sure you have plenty of toys. We have a huge play box full of toys but chose just to take Fs favourites with us due to space. We brought – plush Minnie and teddy who sleep in her cot, Emily doll, singing Fisher Price teapot and a soft book. She barely looked at the teapot though as the grandparents had brought a ton of stuff for her and bought her goodness knows how much new stuff while we were there. Her complete and utter favourite by a long shot was Sophie the teething giraffe. I was recommended this by Amy and when I googled it before we went on holiday I discovered that it was French. So we bought F a whole set of Sophi toys and a spare one while we were there and she absolutely loves it! 3 weeks later with her second tooth coming through it barely leaves her mouth. I realise that it can be very expensive treating your children to new toys just to add to the hundreds of ones they already have. It would be even worse going to WDW and being surrounded by all those plushes! However if they do find something they love i.e. Sophie, definitely buy 2 just in case one goes missing. Check back this afternoon for part 2 of this article and more great tips from Janine. Contributed by Janine Pipe from Swindon, England. She is a proud wife and mommy to almost 7 month old Felicity. You can follow her on Twitter, @Disneynine. Great post Janine! Thank you! 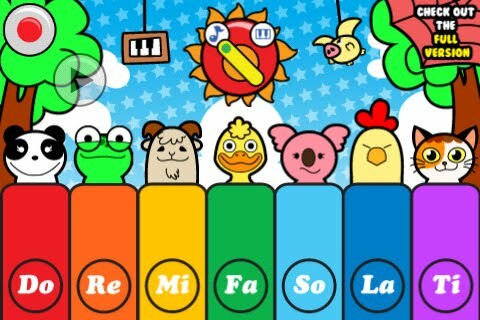 I got the free baby piano app when I was putting the photos in this article. How cute! Thanks for the tip!